What better place to build a park than right over top of a parking lot? In a move that would surely please Joni Mitchell â who, it should be noted, used to spend time around these parts â that's what the planners behind Village of Yorkville Park did, reclaiming a parking lot in the upscale Toronto neighbourhood and turning it into a distinctly Yorkville kind of park. The park has been honoured with the American Society of Landscape Architects Award, the City of Toronto Urban Design Award of Excellence and the International Downtown's Association Award of Merit. 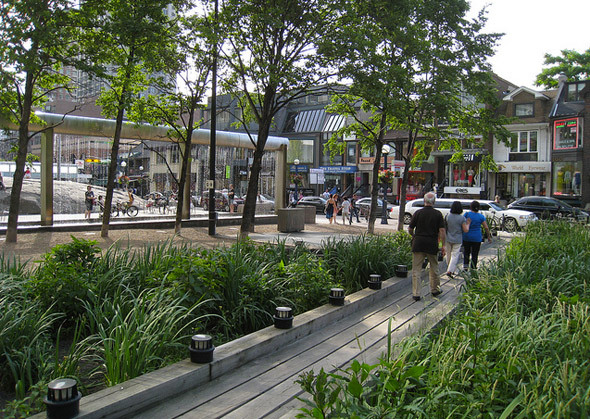 Yorkville Village Park is divided into 11 sections designed to represent the differing Canadian landscapes. Dividing lines between the sections also marks the lot lines where Victorian houses used to sit. These houses were demolished in the 1950s to make way for the Bloor subway line. The former residents allowed the city to make way for the future, but were firm that they wanted a park to be built over top of the subway station. What the residents got instead was a commuter parking lot paved over the area. The former neighbours let it be known they were not going to abandon hope that a park would be built, and their persistence finally paid off in 1973 when the city agreed to replace the parking lot with a public park. As these things tend to go in Toronto though, the park didn't really get moving until 18 years later. 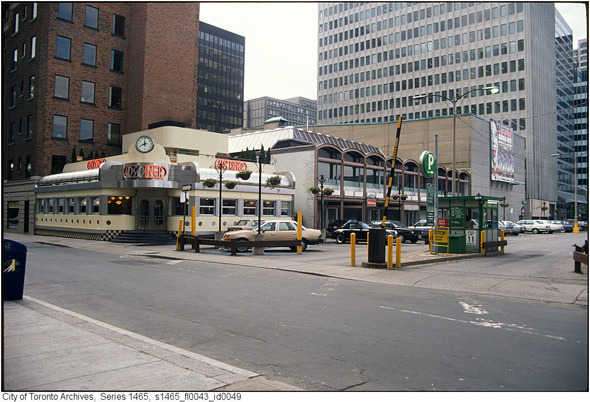 It wasn't until 1991 (around the vintage of the above photo) that the city began planning for the area. A design competition was launched and a jury of local residents and design gurus selected the plan that became what the park is today. The 11 landscapes represented in the park include upland forests, marshes, groves, prairies, orchards and of course the Rock (pre-wrestler). The 650 tonne granite rock was taken from the Canadian Shield and required 20 truckloads to transplant it to Yorkville. The approximately 1 billion year old rock was assembled in Toronto and serves as neighbourhood and city landmark just outside the entrance to Bay Station. At the east end of the park you'll find circular benches around a group of Scots Pine trees. Moving westward the park includes crab apple trees, a marshy wetland with tall weeds and a wooden boardwalk around the marshy terrain. A manmade waterfall borders a courtyard filled with benches and chairs. The park has some very intricate and diverse plant life, but the grey areas between the designated sections are continuous with the busy street and sidewalk. 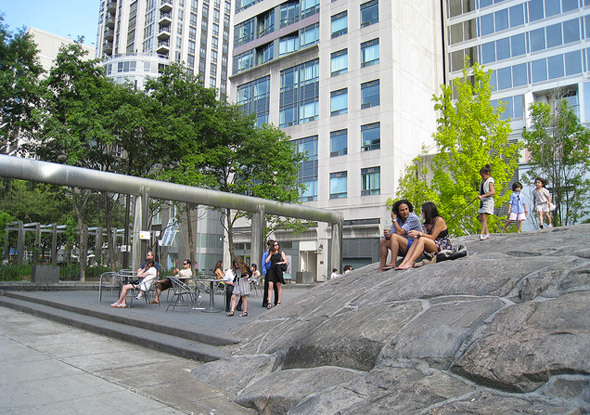 It avoids seeming like just an art piece, with benches, rocks and other elements becoming crowded with people on summer weekends and lunch hours. The park mixes well sculpted exotic plants and inner-city concrete smoothly, appearing both artistic and approachable, high-concept and functional. The $3.5 million park is located on the south side of Cumberland Street and borders some prime real estate. The park is just steps from many specialty boutiques and fine dining, with the surrounding shops ranked as the third-most expensive retail space in all of North America in 2008. Village of Yorkville Park is a good indication of what thoughtful design, innovation, and a chunk of money can provide.